I think it’s safe to say that I am getting back into the swing of things with CSA Tuesdays. Now, if I could just get used to blogging about it all the time 🙂 It being a holiday week didn’t exactly help my blogging habits, but I have to say that it was an amazing weekend spent with my husband, parents, siblings & their significant others. Canoeing, fireworks, shopping, and of course lots of walking, drinking, and eating! 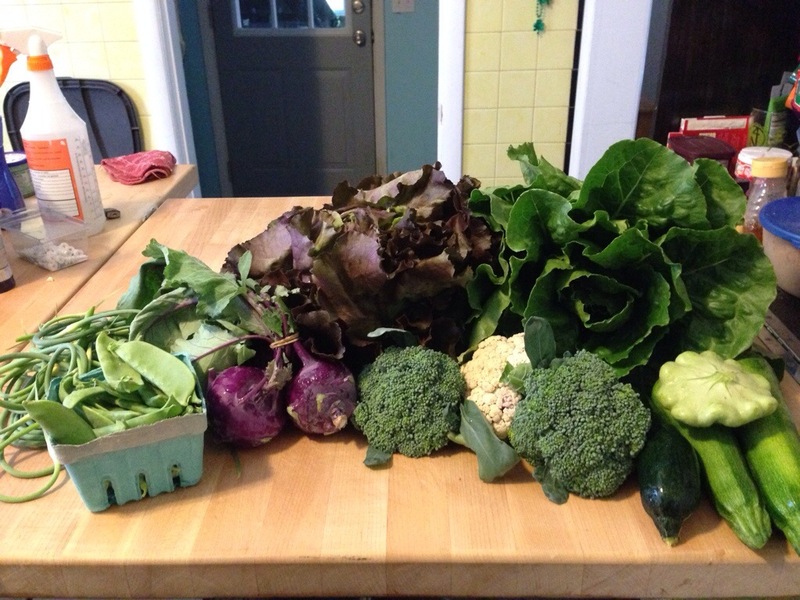 Week 2 of CSA was still mostly green, but I was very happy to see a bit more variety! garlic scapes – as you’ve guessed, I’m making another round of pesto. Just can’t get enough! purple kohlrabi – These were slicedand eaten raw. I always struggle to use up kohlrabi, but I knew that my parents like to eat it raw so I didn’t have any trouble this time around!